Experience massaging bliss in this luxury whirlpool spacious enough for two. The water jets can be individually adjusted to suit each bathers preferences for direction and intensity, while the supportive design with molded armrests embraces you in comfort. A slip-resistant Safeguard floor finish enhances safety. Contoured drain overflow allows for comfortable bathing at either end or room for two. KOHLER(R) Experience whirlpools create a sensory sanctuary where you can relax, rejuvenate and renew. Aptly named for its charmingly angular silhouette, the Askew baths striking design and clean lines make it a focal point for your contemporary bathroom. The unique solid-surface material has the attractive matte finish of smooth stone but feels warm to the touch and is remarkably easy to clean. 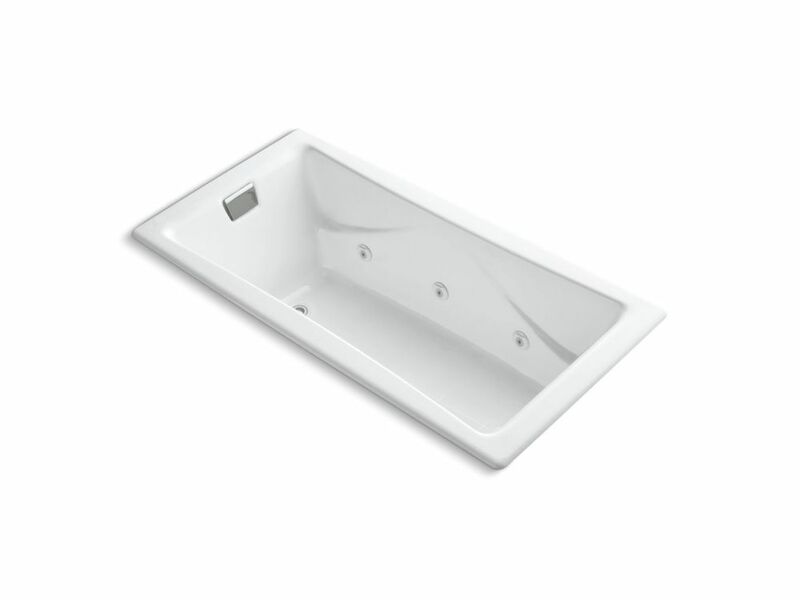 An integral slotted overflow lets you enjoy deep, immersive bathing. The center toe-tap drain with cover creates a sleek look. An update of a bestseller, Bellwether features a clean, contemporary design in a popular, industry-standard size. Its integral apron simplifies alcove installation, while a low step-over threshold allows for comfortable entry and exit. Bellwethers wide ledges provide storage space for towels, toiletries, and other items. Crafted from enameled cast iron, this bath offers years of reliable performance. An update of a bestseller, Bellwether features a clean, contemporary design in a popular, industry-standard size. Its integral apron simplifies alcove installation, while a low step-over threshold allows for comfortable entry and exit. Bellwether's wide ledges provide storage space for towels, toiletries, and other items. Crafted from enamelled cast iron, this bath offers years of reliable performance. Tea-For-Two 72 X 36 inch Drop Inch Whirlpool With Reversible Drain And Heater Without Trim, White Experience massaging bliss in this luxury whirlpool spacious enough for two. The water jets can be individually adjusted to suit each bathers preferences for direction and intensity, while the supportive design with molded armrests embraces you in comfort. A slip-resistant Safeguard floor finish enhances safety.